While browsing on Instagram I stumbled across African print gym tights. This was a big moment. African print fabric, sometimes called Ankara, has been made into dresses, furniture, and even socks. Now we see African print on gym attire. This is particularly important, here’s why. The practice of health and fitness have been made a White space. There is a pervasive idea that Black people, particularly Black womxn, don’t exercise. In South Africa specifically, the actual gym areas have been made spaces reserved for White people, where Black people don’t belong. There have been reported cases where some White people reinforce this unwritten rule. Apart from that gym attire tends to be expensive. Again, in South Africa, class is directly linked to race because of our recent past of apartheid. This means Black people are further excluded from the health and fitness communities or physical gym spaces for not having the ‘proper’ attire or accessories. The gym membership fees add to this divide. 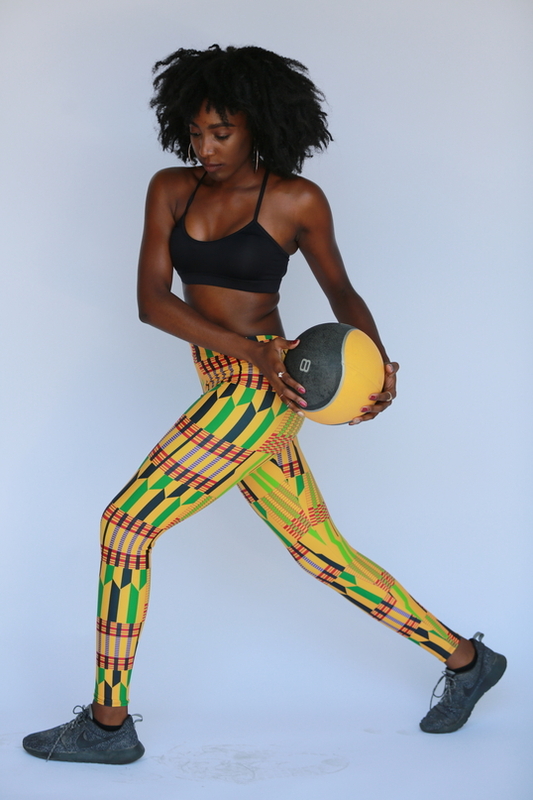 If you are still wondering why it is important that African print patterned gym attire exist let me explain. While some fabrics known as African fabrics do not originate in Africa the dynamic prints we now know are directly associated with Africa. The disruption of whiteness as the norm is very important for people of colour. London Devine is the company that is contributing to the inclusion of people of African descent when it comes to fashion. The company who created these Ankara gym tights may have not necessarily sought to make a political statement but that is still the result. The gap in the clothing market reflected the political undertones of fashion.”Being a curvy female who literally lived in jeans and leggings I would often wish that the traditional prints I loved so much would be available in stretch fabric as I was never comfortable with the way the fabric would be tailored to fit my form” she added. London Devine’s tights also come in a wide range of sizes, from XS to 6XL, which breaks the ‘skinny girl’ norm. These tights are also wearable outside the gym.So what does it mean having Ankara print tights in spaces, like the gym, that are viewed as White spaces? It means Black people are claiming the fitness spaces as theirs too. Black people can represent themselves and be represented in perceived White spaces. There is an opportunity for Black people to no longer be seen as assimilating to whiteness when in spaces that are thought to be White. The point of it all is that representation matters, even at the gym. Let me know what you think about this post in the comments. Also feel free to like and share.